LONG ISLAND CITY, NY–Have you ever had to shout to call your family to the dinner table? "There are some really famous examples of recruitment in other social insect groups–but foraging in social wasps was never thought to involve complex communication," said Professor Taylor. Examples include ants producing pheromone trails–resulting in lines of ants following each other to and from their nest. "Also, the honey bee waggle dance is one of the most iconic forms of communication found in any organism, and that includes social insects or otherwise," said Professor Taylor. "These wasps often show up at picnics, ballgames–anywhere food can be found. 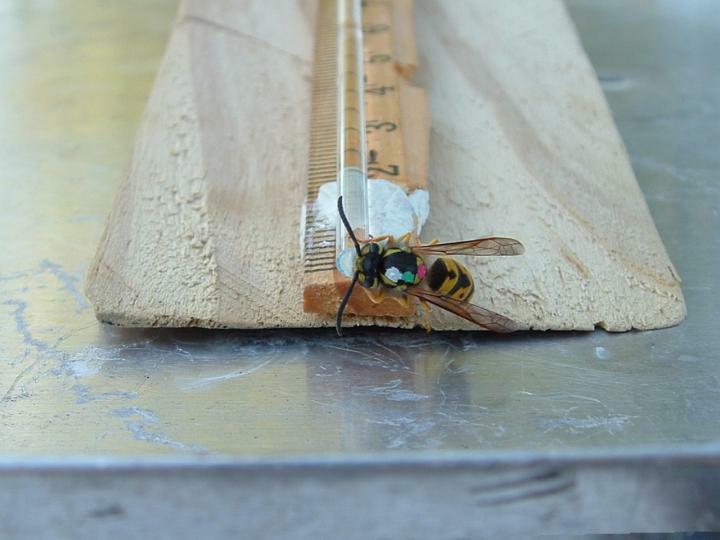 German yellowjackets are notorious for aggressively defending their nests," said Professor Taylor. "Anyone who has stepped on one won't soon forget it. I suspect that most people who say they were stung by a bee were actually stung by one of these wasps. But I don't want to make them sound like ruthless monsters. When they sting, it's most often to defend themselves or the other members of the colony." LaGuardia Community College, located in Long Island City, Queens, educates more than 50,000 New Yorkers annually through degree, certificate, and continuing education programs. Our guiding principle Dare To Do More reflects our belief in the transformative power of education–not just for individuals, but for our community and our country–creating pathways for achievement and safeguarding the middle class. LaGuardia is a national voice on behalf of community colleges, where half of all US college students study. Part of the City University of New York (CUNY), the College reflects the legacy of our namesake, Fiorello H. LaGuardia, the former NYC mayor beloved for his championing the underserved. Since our doors opened in 1971, our programs regularly become national models for pushing boundaries to give people of all backgrounds access to a high quality, affordable college education. We invite you to join us in imagining what our students, our community, and our country can become. Visit http://www.LaGuardia.edu to learn more.